Forums » Discussions » General mountain dulcimer or music discussions » Page » Introduce Yourself! Thank you all so much for such a warm welcome. I've been making mountain dulcimers and other stringed instruments since I graduated college in 1993. These days I'm a volunteer on staff at Artichoke Music in Portland Oregon where I can be found once or twice a week doing instrument repair. A good job on a beautiful dulcimer! Here's to many more! Very nice instrument, Jack. Thanks for sharing it with us. Love the rosy blonde color of that dulcimer, Jack! My name is Jack. The Mountain Dulcimer has been a love of mine for many years. While I am able to play a few songs in a recognizable fashion, it's the construction of the instrument that truly enthralls me. Hi Barlow45, I suggest you go to our Beginners Group and read a few of the threads there that have great advice about buying a 'first dulcimer' that's within your price range. You have to JOIN that group in order to fully read the discussions in it (you can UNjoin any time just as easily). You'll probably find all the help you need by reading those threads, plus other great tips for your purchase! p.s. loved your post about your cardboard dulcimer, Lisa! I have the dulcimers pictured in my avatar. The one I play daily, often for a couple of hours, is the cardboard one. I’m not worried if my three small dogs knock it out of my lap while I sit my my recliner. While I don’t want it to hit the floor, it’s happened a few times with no damage. It’s always next to my chair, ready to play. It sounds fantastic, and as Ken noted, the frets are placed accurately. I love it so much as is, I no longer have no plans to upgrade the box to wood. Don’t be put off by cardboard. You can buy one all put together, or buy a kit and paint and decorate it just the way she likes, too. There’s a saying about musical instruments ... someone asks, What is the best make and model? The answer should be, the one I play the most. Hello all. I'm looking to purchase my wife a dulcimer. My budget is $250 max. She nor I have ever played and know absolutely nothing about them. We would appreciate any suggestions as to what to purchase for her. Strings are strings -- as long as the gauge is right. Lisa -- secret to not breaking strings when tuning is to always tune a "singing" string. Hold the tuner knob you think is the right one. Pluck the string and turn it 1/4 turn. If the singing string does not change pitch -- STOP -- you have the wrong tuner. LOL! Ken, the secret to not breaking strings is not trying to tune it up five notes higher then it should be! Unfortunately, I got the last pack of strings from the music store, so if I keep experimenting, I’m going to have to resort to banjo strings until they get some real dulcimer strings back in stock. Since this is a discussion called "Introduce Yourself", most members don't think to read it in order to answer questions. If you have specific questions about music and/or dulcimers, you'll greatly improve your chances of getting helpful answers if you create a new discussion in the General forum that has a title related to your question, such as maybe "Good medleys of Christmas Carols? ", "Pickling Pickled Peppers song? ", etc. When members see a new discussion like that, they'll often go read it and respond in that discussion if they know answers. When you click the top link to "Forums", you can then click on the General dulcimer/music forum.... once there, click the "+" Plus button to create a NEW discussion with your question and your own thread title. Thanks and welcome to FOTMD! Hello, I'm based in Hattiesburg. Love to play my dulcimer and this past Christmas there were a lot of carols that sound magical on the instrument. Has anyone found a good medley of carols that sound good? This is Bro Dave from Hattiesburg, MS. I play with the Magnolia Strings. Will post a picture of the group shortly. Mr. Paul Sykes and his wife Betty are our leaders. Anyone heard of them? Susie, I would love to go the Evart, but someone else already requested that weekend off. I’ll have to ask, since generally, only one of us are allowed vacation at a time. I’ve read your pdf’s Ken, every helpful to a newbie like me, thanks! It’s going to be a while before I play any events, though I could see how dulcimer music would be really nice during our tree lighting/rememberance ceremony. On another note, I got my second-hand cardboard dulcimer today, three days earlier then expected! I’m going to have fun with it this weekend. I already managed to break one string trying different tunings, lucky I bought a pack on my way home. DAc sounds pretty cool, I really dig it, though I better stick with DAa for now. Anyhooo, it’s an ugly cuss, painted brown cardboard, the neck is pretty rough cut with no strum area scooped out, but the fretting is pretty good according to my tuner, so that’s all that matters right now. There is no fretboard, it’s just a plank with frets pressed into it. I guess I’ll name it Plank. It’s a lot of fun, and my dogs enjoy it a lot more than my penny whistles. Probably the best 27 bucks I spent in a long time. 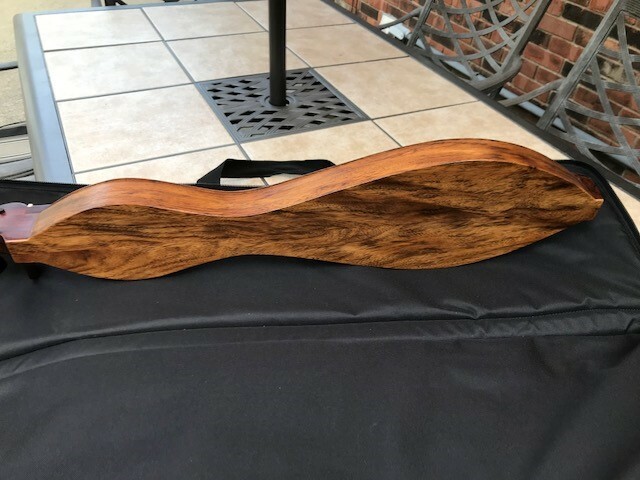 I don’t know if I’d bother putting this neck on a better body, but who knows, I’ve got cigar boxes laying around, and a huge exotic wood warehouse is a few blocks from where I work, Bell Forest Products. They have instrument quality fretboard wood and neck wood all ready to go. They also got this huge pile of the coolest scrap wood they sell by the pound, so I might go crazy and try to make a proper box body for Plank and shoot some roofing staples under the melody string to get some of the frets it’s missing (no 6.5 fret). I certainly can’t make a worse box than the cardboard box it’s currently made from. I’m already very fond of Plank, I think a box upgrade is in the future. Hello, Lisa. And, again, welcome to FOTMD. Looks like we have something else in common besides Marquette; I was a hospice chaplain for 28 years. I played my dulcimer for patients and for staff/volunteers. I played for our annual volunteer banquet, for our annual memorial service, and our annual tree lighting. The dulcimer is a good instrument for help in decompressing. Enjoy it. Hi Lisa, I'm in Gaylord. 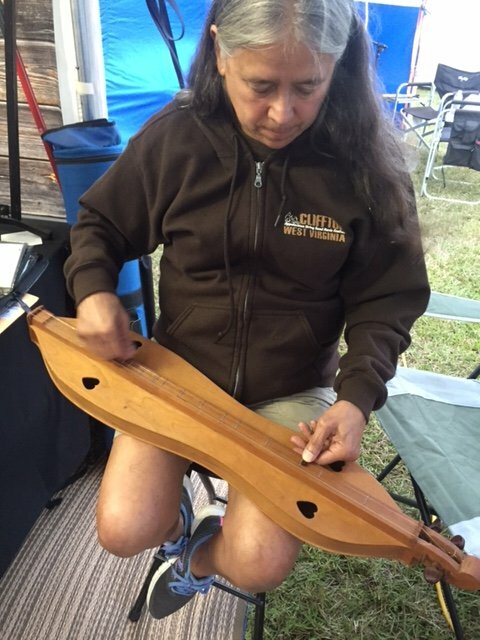 If you ever have the time, you should consider attending the Evart Dulcimer Fest (ODPC Funfest) in July. It is full of workshops for all levels and all instruments. I offered to meet another new player there many years ago, to help her along, and now we are great friends. If you choose to go, my sister and I will be there this year. BTW, I'm about your age, I'm 55. I play many instruments, including the Native American Flute. There are usually several workshops for NAF at Evart too. If you have questions, feel free to PM me. Hi Lisa; Welcome to the wacky world of dulcimers. I think you're going to fit right in! A Cardboard dulcimer is a good, inexpensive place to start -- the frets are accurately place which means the notes are true. Later, if you like, you can have a wooden body made (or make it yourself) and put the fretboard from your cardboard dulcimer on new body. I did that recently for a student of mine, and it was pretty inexpensive to do. Lisa, welcome to fotmd.com. You will meet many new friends here, who will help you in your journey with this wonderful instrument, called a dulcimer. Often, I use a NAF in my assisted living home ministry. There are others too. Hi, I'm Lisa. I love in Marquette, Upper Michigan, two blocks from Lake Superior. I enjoy playing musical instruments, mainly woodwinds until now. clarinet, recorder, Native American flute, irish penny whistle and simple, cheap bamboo flutes. I was terrible at improvising until I took up NA flute five or so years ago, I couldn't let go and just play. I've always loved string instruments, but have been frustrated by the learning curve. I'm not a singer, and just strumming chords was boring to me, and finger picking a six string or even a ukulele was beyond my level of patience and time. I do love playing the kalimba or thumb piano, I have a small collection of those. Very easy and fun to play. I remembered in the 80s, one of my friends got a dulcimer kit for Christmas, which she and her dad built. I vaguely remember playing it a few times, but I was too into clarinet to be interested. Now, my musical tastes have matured, and I enjoy world music, especially Irish traditional music, slow ballads, music along those lines. While surfing youtube, I stumbled upon the dulcimer, and knew that's what I've been looking for. I've got a cheap cardboard dulcimer on the way to use until I find a nicer one to purchase. I'm currently reading the forums heavily to get a grasp of what I should be looking for, as whatever I get will come in the mail. There's nothing local for sale, and I don't know any players. I'm glad there's such an active forum to read, it's very helpful for someone in my position. In real life, I work as a care aide for a home health and hospice company. I'm kind of the jill of all trades, I work half in the office, half in the field doing visits and training new aides. Music is necessary for me to decompress, it can be extremely stressful at work. I have a husband, 21 yr old stepson, three rescue dogs, and take care of my 89 year old mother, though she lives alone, for now. I'm 51 years old, and my job has taught me not to wait too long to do something important to you, life can get messy really fast. This is important to me, I'm really looking forward to my dulcimer journey. Hi Jamie. Welcome to the wonderful world of FOTMD. If you stick around a while, you will make many new friends here. Literally just got my dulcimer yesterday and then read the decidedly lukewarm opine of Roosebeck instruments but what's done is done. Anyone want to donate a dulcimer to someone that made a mistake? Don't let anyone tell you your first dulcimer purchase was a mistake no matter the brand. I played the first seven years on a $100 kit with friction pegs. I wrote many of my tunes on that dulcimer and I performed with it at the World's Fair in 1986 and the Seattle Folklife festival. If you play a little bit everyday you will get better regardless of the instrument. Can you find a better instrument? Absolutely! You can spend $4000 on a dulcimer but you will not learn any faster. You are about to discover that every dulcimer you purchase or build from here on will never be enough. Well heck... Firstly I'm not a Bob but a Jamie. TGB was my internet handle from way back that came from being a Robert E. Howard fan (creator of Conan) as H.P. Lovecraft called him Two Gun Bob and I adopted the moniker and all. Literally just got my dulcimer yesterday and then read the decidedly lukewarm opine of Roosebeck instruments but what's done is done. Anyone want to donate a dulcimer to someone that made a mistake? All said I sat down learning The Water is Wide and muddled through. If anything the challenge is getting those hand positions which are different from bass AND different from the balalaika. At least the balalaika prepped me for using my thumb so there's that. All that folded up about ten years ago and I pretty much just tinkered on the bass and got bored so picked up the balalaika last year to try my hand at Russian folk music. After a year I decided to branch out again and ordered the dulcimer and joined here as I really miss being a part of a musical community. I appreciate the warm welcomes so far and look forward to getting stuck in with yet another new instrument. Let's see... In the last ten years I spend a lot of my time when not working painting figures for wargaming. The gaming is mostly to justify painting as that relaxes me even more than playing music. Honestly, when I'm not in a band playing live I kind of get depressed about the music thing. right now I'm working on an American Civil War project, probably what ignited the interest in the dulcimer. Also done a plethora of fantasy/sci fi stuff over the years. And that's about it for the moment. Look forward to getting to know this community and learning about yet another instrument. I'm sure I'll find some old friends here! -use the Plus (+) button to create a new discussion. Be sure to explore the various links along the TOP navigation bar to get familiar with the site layout. Hello, I appreciate the opportunity to be a part of this site. I am an absolute beginner and am a little overwhelmed. 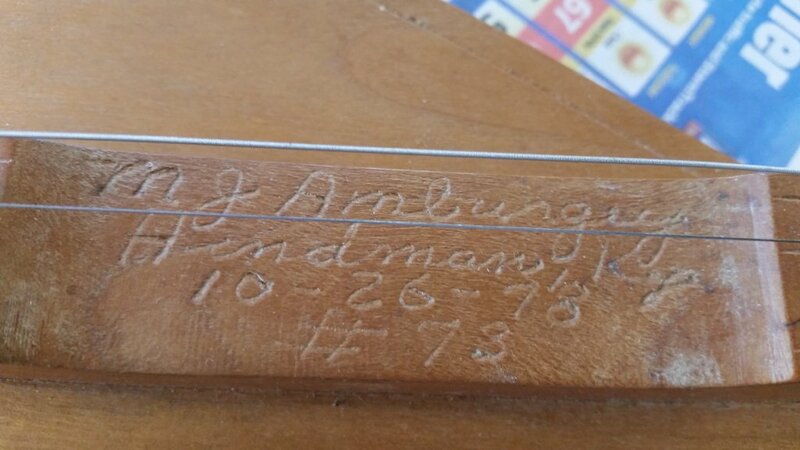 I purchased a used dulcimer that I found at a thrift store last week. I came home and started listening to some dulcimer music and became enthralled with the idea of learning to play. As a mother of five, with ages ranging from 22 to 7, I am at a point in my life where I feel that I need to do something for myself. I stumbled across Strumelia’s YouTube videos and was hooked. I am fearful that the instrument is not a very good quality one though. 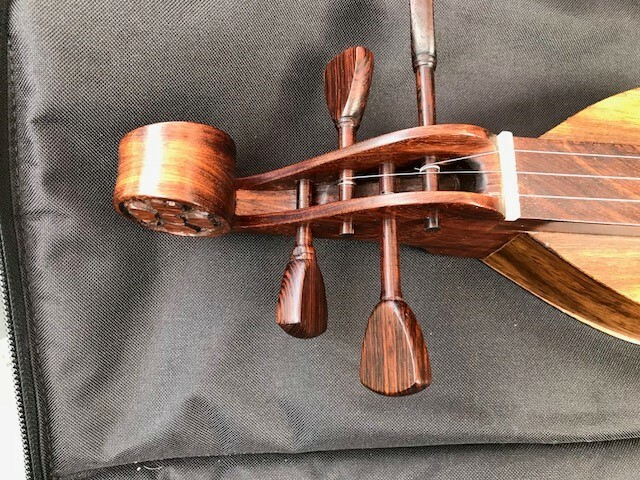 My oldest played violin for many years and we learned early on that for the best chance of success, you need a decent instrument. Which is the best forum for me to post a couple of pictures and ask some questions about the dulcimer I have? I need to determine if I can proceed with this one or start looking for a new one. Thanks in advance. Welcome, Pondoro. Sounds like you may play several folk instruments in depth before adding to your Instrument Zoo. I think you will enjoy the dulcimer. As Strumelia mentioned, there are so many instruments I yearn to play well but it would take several lifetimes. I haven't been able to restrain myself enough to fit that playing well requirement. Fortunately the dulcimer is forgiving of my dabbling. I sometimes say this is what happens when you give a Girl Scout the Dabbler badge. I still am one. Several of us here are. I think you will feel right at home, there's even a forum about Adventures with 'Other's Instruments. Enjoy! Here's an article I wrote a number of years back called I Just Got A Dulcimer, Now What? It's an illustrated glossary of dulcimer terms (so we all speak the same lingo); plus answers to many beginner questions about tuning, playing, care and feeding of your new acquisition. Welcome Pondoro. You will find many new friends here. While this is a dulcimer forum, there are many who play ukulele and harmonica. Bodhran? Now you lost me. I'll have to Google it. 5 min later: Now I know. A one sided shallow drum. Interesting. Hi Pondoro. I envy your years of bodhran lessons! There are several instruments I yearn to play well... but alas I'd need three lifetimes to do so. How sweet that your wife is encouraging your music adventures! I hope you enjoy it here on FOTMD. Hi, I've played the harmonica for 45 years or so, the ukulele for twelve, and the bodhrán for three. I've actually taken lessons for three years on the bodhrán. Anyway I want to play an old time American instrument and my wife is funding a mountain dulcimer for Christmas. So I'll soon be trying my hand on that. I like pretty much all music, but I'm looking forward to old time folk tunes and Christmas songs on my dulcimer. There are a lot of great people here that will help you! You are beginning a wonderful journey! Have fun! Welcome @fredr, you will enjoy this forum. @fredr Welcome! There's lots to see and hear-- enjoy exploring FOTMD! Hi Everyone I am new to the group and also to the Mountain Dulcimer. Saw and heard my first one in July last year, the memory stuck. So a year later I Found a new to me McSpadden and here we go! I have never played an instrament before and there isn't a Dulcimer teacher near me. That being said, I am thankful to join your group and look forward to learning from you all. Welcome Atilwi! Glad you found us. You're in for a fabulous experience! Always ask questions -- we're here to help. There are no stupid or inappropriate questions, just ones that don't get answered. I've attached an article I wrote a few years back called I Just Got A Dulcimer, Now What?. It's an illustrated glossary of dulcimer terms, so we all speak the same lingo when asking and answering questions. Plus it has answers to many beginner questions about tuning, playing, care and feeding of your new friend. I teach elementary music in Kansas and just ordered my first Dulcimer. Found this place when I was researching what to look for so I could choose a good one! E. TN boy transplanted to Texas and still holding on to my mountain roots! Hey, @Nanners -- welcome and happy strumming on your new dulcimer! Hi y'all! I'm Nanners, a newb from Austin. I just love the sweet, sweet sound of a dulcimer! I saw one for the first time in Mountainview, Arkansas when hubby and I were there for a bluegrass festival a couple of years ago. (We lead a bluegrass/folk jam on Tuesdays, him on guitar, me on fiddle). Time passed, and a couple of months ago I was in a local music store with a friend looking to upgrade her Mandolin... there were some dulcimers hanging on the wall! I picked one up and decided it was time to finally do this dulcimer thing. So here I am trying to learn a new instrument. Wish me luck! Hey Jools, jump right in, the water's fine. Hi everyone, I'm Jools from Kent in the UK. I'd been thinking about learning the dulcimer for a while & decided to go for it. I've just bought a lovely 30yr old 'Green River' walnut 3 string. It arrived on Saturday. It sounds beautiful & I'm really enjoying playing it. I'm learning some slow ballads to start with, but when I get more fluid on it I'd like to learn some bluegrass tunes. Thanks for the welcome messages I've received, I appreciate them, & I look forward to chatting with you guys & hopefully picking up some ideas. 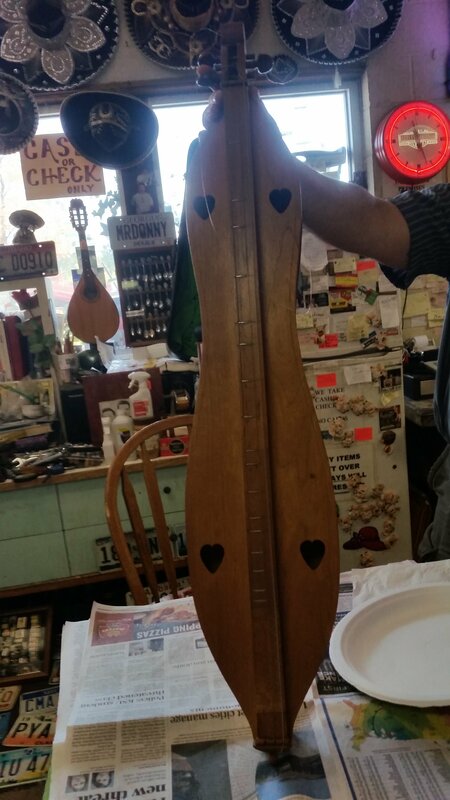 How very lovely that you found your dulcimer over Christmas in Berea Kentucky! and then make a new discussion asking about anyone perhaps nearby you. That group has not had any NEW discussions in a while, and I'm sure if you post there the Canadian group members will see it and jump in to greet you! Hello to all. I'm Noah. 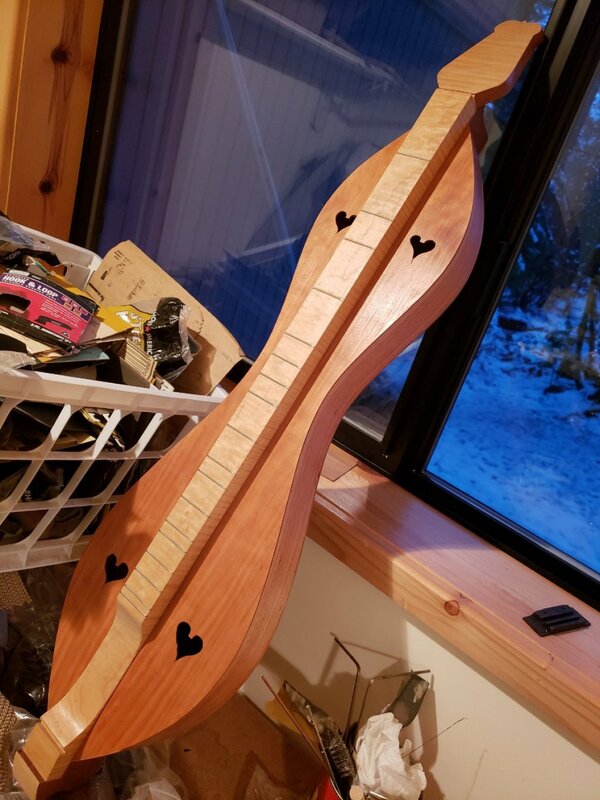 Though I'm better known for my banjo playing and building on Banjo Hangout and YouTube (I've been playing for about ten years and building gourd and mountain style banjos for about five), I've had much interest in the mountain dulcimer. I started playing dulcimer in 2015 on the first one I made, after deciding that instead of buying one I could probably make a decent one, since I had about 20 banjos under my belt at the time. To date, I've made four. My first was a 4-string (double melody) walnut/cherry hourglass, and after playing it for some time and deciding what I liked/didn't like, I made my second, a 3-string walnut teardrop, which is the style I've favored the most and built since. I have a few pics of these on my profile. I was aware that this site existed, but I completely forgot about it until stumbling upon it again and decided to join. Welcome John! That Kinniard dulcimer is beautiful and quite the find. Guitar is my first instrument, since 1973. 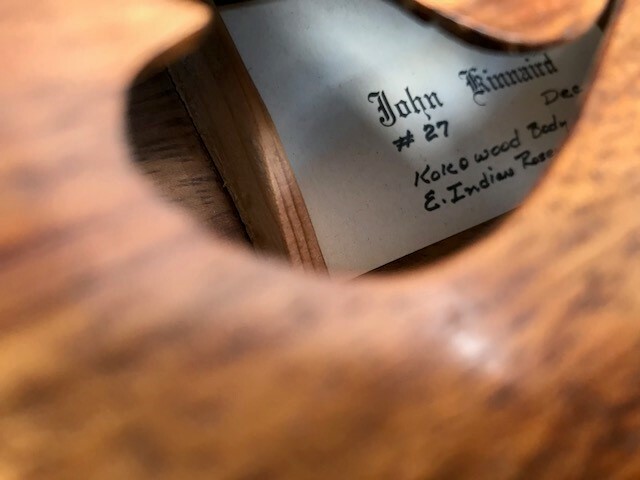 I'm well aware of Kinniard guitars.....works of art and beautiful voices. I bet that dulcimer is truly special. Thank You Ken. The links are very much appreciated. Hi John-c Welcome to our wacky and wonderful world. I've added links to a couple of articles I wrote years ago, which you may find useful as you start your dulcimer journey. I Just Got A Dulcimer, Now What? is an illustrated glossary of dulcimer terms (so we all speak the same lingo), plus answers to many beginner questions about tuning, playing, care and feeding of your new instrument. Get Noterized is a beginner's guide to playing the dulcimer in a traditional (non-3-finger chord) style. Uncontrite Modal Folker is a discussion of musical Modes and Modal Tunings and how they apply to the mountain dulcimer. Hello everyone. I'm John from Lawrenceburg, KY. I had a dulcimer back in the 80s. Not sure who it was made by, but learned how to play with a noter a little. I don't think at the time I really understood or appreciated the instrument so I traded it off, and my interests turned towards the guitar. 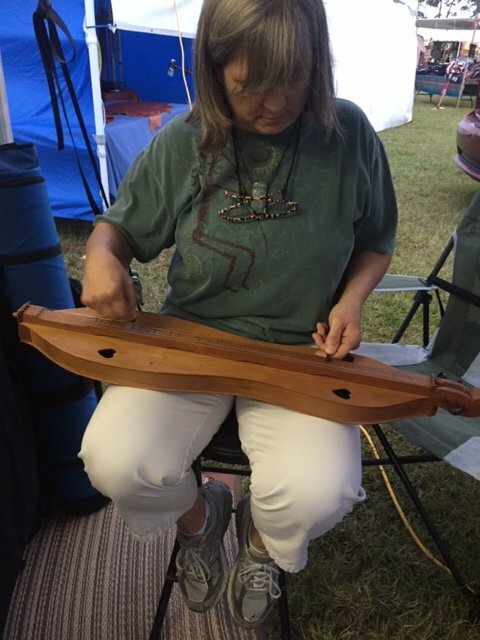 About 3 years ago I purchased a Psaltery at the Gatlinburg craftsman fair and have enjoyed learning it. Just recently I came across a John Kinniard Dulcimer (pics attached). I sent John an email and did get a response. He was very surprised that I found one of his, but as I understand it he only makes very high end guitars now. I have a renewed interest in the Dulcimer now, and basically lost my mind over them. Purchased a McSpadden off ebay and anxiously waiting it's arrival. BTW if anyone has any info or experience with the John Kinniard Dulcimer please share. ...but I like to play and I find that different instruments make me think differently. On guitar, mandolin, or dulcimer, I come up with different things. The modal nature of the dulcimer, in particular, forces me away from my natural tendency toward chromaticism. Hey Craig good to meet you! Wow - a Capritaurus AND a D-00. What a great pair. I played guitar for many years before I started the dulcimer. The main draw for me was exactly as you say: diatonic forced me to rethink composing and experimenting with different tuning and string configurations. As a result, I've now gone back to playing guitar again and started noodling in CGCFCD - what an amazing find courtesy of Martin Simpson! Hi, I'm Craig and I'm new around here. I discovered the site the other day while searching for info about my dulcimers. I'm not really a great dulcimer player; I'm better at guitar, but I like to play and I find that different instruments make me think differently. On guitar, mandolin, or dulcimer, I come up with different things. The modal nature of the dulcimer, in particular, forces me away from my natural tendency toward chromaticism. R&C, enjoy that cool mountain dulcimer. Happy strumming! Thanks! I was very pleased to learn its history and to manage to acquire it. Marsha gave me some good advice about not changing anything about it. I like playing noter style. I love the tradition and history of this instrument. My sister-in-law started lessons in Florida this year, although I suspect she's playing chord style. But we're going to see what we can do together to entertain the family over Christmas. Oh my, what a great find, Rocks! Whatever you do, don't change this perfect and wonderful old dulcimer- that's a collector's instrument and is in mint condition! I see the frets are only under the melody string..so enjoy playing it in drone style, as it was intended to be played. 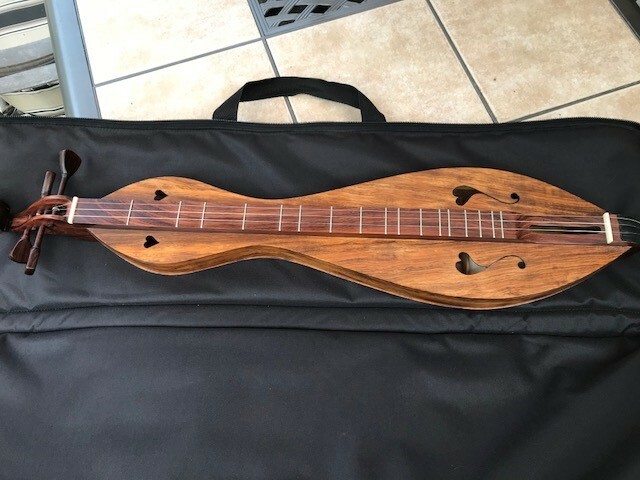 (you can always later get a nice second dulcimer for chord style playing, with extra frets too if you want to explore that style) You're a lucky lady to now be the Amburgey's new player! I took these photos the day I found the dulcimer. It's a miracle that I managed to get it. I didn't buy it until my third trip there over about a week. Nice finds don't EVER stay that long without being snapped up. Hi, I'm Lizabeth. I posted to the First Dulcimer thread before I saw this, so I've got an intro on there. But, briefly, I've wanted a dulcimer since high school, when a friend learned to play during a summer working in the Appalachians. I looked at them a lot but never pulled the trigger until a couple of weeks ago when I found a mountain dulcimer in a flea market. I eventually bought it. It's a Morris Jethro Amburgey (son of Jethro) built in 1978, and it's in perfect condition. I'm teaching myself noter and drone playing. I've been playing native American flute for four years. My family is pretty musical, so I pick things up pretty quickly. I love being here. I think forums are an excellent way to connect folks and disseminate information. I hope these photos are right-side up! The first one is of Marsha Harris. She put a new string on for me, tuned the dulcimer, and gave me some pointers. Any members who would like to tell us a little something about themselves? We love to welcome new FOTMD family members, especially during the holiday season! Hi! My name is Sherri and I am new to fotmd. I am anxiously awaiting the arrival of my new dulcimer from Blue Lion this coming week. I placed acoustic guitar many years ago and originally heard my first dulcimer music at a folk art show about 25 years ago. I always wanted to play and just never could find the time as I spent much of my younger adult life working and completing my education. I'm now at a point in my life where I have a bit more time. My mother and brother are both musicians - brother plays guitar and mother played lap and pedal steel. Mom passed in March at the age of 92 and I decided there was no better way to keep her memory alive than through music and I chose to use a bit of my inheritance to launch my interest in playing dulcimer. I look forward to learning from those with experience on the forum! It's a small world, I'm from Norfolk, England as well. I'm semi retired now ; I used to teach children with Special Needs (of varying types .....) and I now write Computer Software occasionally, contract work. I'm currently working on a (free definitely open source probably) visual TAB player for Dulcimers to help me learn, basically you feed TAB and/or Chords into it plus some timing data and it plays it back at you showing the TAB, you can change the speed etc. If you've ever used Yousician, a bit like that, except there's no audio detection of what you're playing. I think we have definitely got to arrange a Meet in …if not Norfolk, then East Anglia, that's 4 of us I know learning mountain dulcimer from these parts (One from Cambridge.) I joined Nonsuch so we could contact through the club. Lynne Gill:Hi Alison - see my introductory post above! I'm new too and live in Norfolk UK - there ARE quite a few dulcimer players in England bit they are few and far between. I joined the Nonsuch club - google them - and they seem a very friendly bunch, many of them on this forum also. I'm a raw beginner myself but love the sound of the mountain dulcimer. Hiya Lynne, I'm up the top end of Cheshire so a fair way from you but it's nice to know there are a few of us about. A friend of mine who lives near Norwich went to the workshops with me and is interested in getting a dulcimer at some point so maybe Norfolk will be the UK hub! She currently plays a lot of ukulele so is at least more used to strings than me. I've joined the Nonsuch Facebook forum but not looked about much, it's all very new. Have seen they seem to do meet ups though which could be good and the northern ones look based in my region. Fun isn't it? Yes, I've met Robin as he was one of the guys doing the workshops. I didn't buy the dulcimer off him but have looked at his site as I picked up his card. He's not actually that far from me as I can drive into North Wales in just over half an hour so it's worth remembering gor the future. At the moment I'm mainly practising basic technique using 2 or 3 simple songs I know but am hoping to build on this and am already seeing some progress. Finding it good stress relief after a long day at work. Hello, I'm very new to all this. 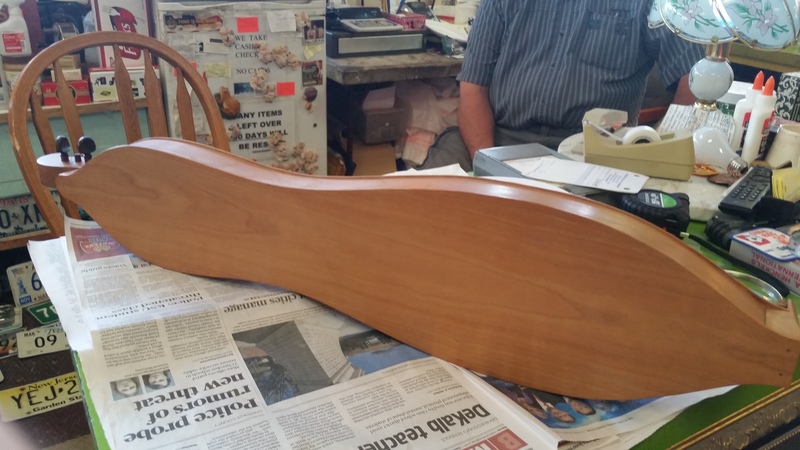 Did an introductory workshop last weekend and ended up buying a second hand Cedar Creek hourglass dulcimer. Not played any instruments since my parents sold the family piano when I was about 17 so well over half a life time ago! Although I'd love to play the piano again I don't have the space and it's not portable. Have friends who play a variety of instruments but haven't been able to join in. Wasn't sure what to try and have toyed with a number of instruments but felt the dulcimer would be a great option. It has a reputation for being easy to pick up basic playing, highly portable and here in England is rare enough that it'll always be a conversation point as hardly anybody has heard of them. On the down side, their rarity also means that there aren't many places that deal with them either. Hi Alison - see my introductory post above! I'm new too and live in Norfolk UK - there ARE quite a few dulcimer players in England bit they are few and far between. I joined the Nonsuch club - google them - and they seem a very friendly bunch, many of them on this forum also. I'm a raw beginner myself but love the sound of the mountain dulcimer. Welcome Alison! Your dulcimer is beautiful! I used to play piano too. I've been learning the dulcimer for about a year. It really is great to have a more portable instrument. So many resources too for us to learn. Have fun! Hello Everyone! I'm Lynne, a retired Paediatric Nurse and Health Visitor. I'm from England, and I bought a very cheap dulcimer about 3 years ago which I never touched (Domestic stuff, elderly mum, 2 successive broken hips, Alzheimers and into a Care Home, not much time for learning a new instrument!) I play fiddle and D/G melodeon, but am so taken with the sound of the mountain dulcimer I'm determined now to set off on the journey in earnest. I signed up to join the UK dulcimer group Nonsuch and hope to be joining them for their weekend retreat in October; until then I am flinging myself upon the charity of an acquaintance (soon to become a friend I'm sure) to get me started. However, I really do need a decent dulcimer so need to explore the how-to-go-about-sourcing one in this country. I think I'll probably start by learning with the noter, but really want to play chords and 'finger dancing'. It all looks so easy, doesn't it, watching those videos! Deceptively so! Wish me luck as I dive in.